Increasing the Allowable Bearing Capacity for Foundations Constructed on Granular Soils Using URETEK Deep Injection™ by Rex Klentzman, P.E. Allowable Bearing Capacity is the load a soil is capable of carrying without a shear failure and with the resulting settlements being tolerable for the built structure. In order to understand Bearing Capacity it is necessary to understand the concepts of shear failure and tolerable settlements. 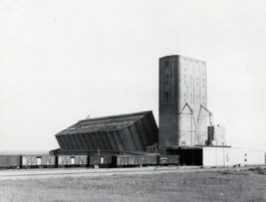 Shear Failure occurs when the load on the foundation is so excessive that the foundation punches into the ground and usually causes the structure to rotate. This process is usually predicated by some initial settlement and can be immediate or can occur over a longer time period. Shear failure can occur in stiff dense soils and also in weak loose soils. The mode of shear failure will vary depending on the site and loading conditions. 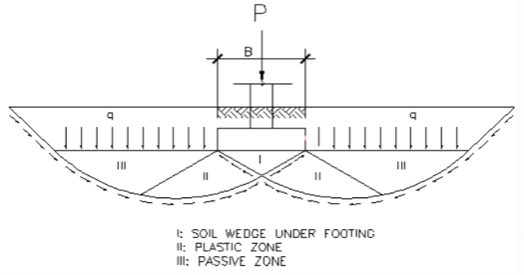 Settlement occurs when the load on the foundation increases the stress in the soil mass and causes soil particle rolling, sliding, crushing, and elastic distortions in the soil beneath the loaded area. The accumulation of these movements in the vertical direction is the settlement. Soil particle sliding and rolling are the principle settlement components. They produce a change in the void ratio and crushing which alters the material slightly. A key soil parameter that is used to calculate the stress a soil can sustain for a particular established level of settlement is the Soil Modulus. Soil Modulus is the relationship between stress and strain. Or in simpler terms how much will the soil compress when a given load is applied, it is the “squishiness” of the soil . The Modulus is expressed in terms of pressure but it is not a measurement of the soils compressive strength. The Deep Injection® Process for soil stabilization was developed, patented, and is currently utilized exclusively by URETEK ICR affiliates. The patented process is a non-destructive, extremely effective soil compaction and densification solution to improve load bearing capacity of weak or loose soil strata. The Deep Injection® Process involves drilling 5/8″ holes through the foundation or footing as required, setting steel tubing at injection depth, injecting our structural polymer, and continuously monitoring surface elevations for movement. When injected the polymer will seek out and fill the voids, therefore compacting the soil. Since soil conditions are variable, it will differ how and where the polymer will spread and seek out voids. The material typically follows the path of least resistance filling the largest voids first and then moving to the smaller voids. URETEK has conducted testing on pre and post treated granular soils (sand) that show URETEK has the potential to increase the soil Modulus at least 800%. This improvement would potentially result in 8 times the allowable load for a given settlement. URETEK treatment binds the soil particles together, significantly reducing the potential for soil particle rolling, sliding and crushing, the primary modes of soil settlement. 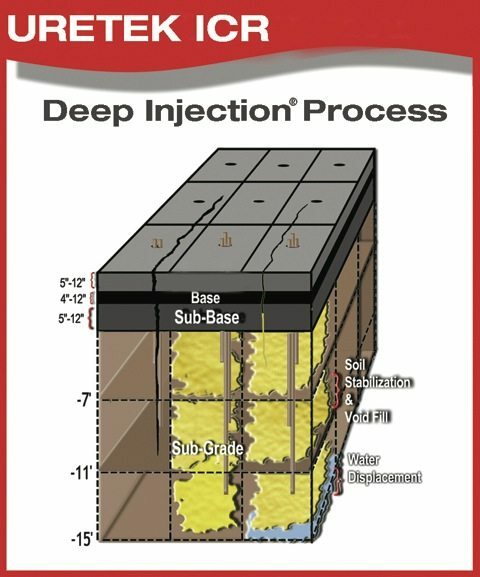 In this way The Deep Injection® Process can increase the Allowable Bear ing Capacity of foundations constructed on granular soils. Utilized across the world by URETEK affiliates, The Deep Injection® Process is extremely versitile and is applied in a number of soil stabilization projects. Copyright © May 2016 URETEK ICR All rights reserved. URETEK. URETEK ICR. and The Deep Injection® Process. are either service marks or registered trademarks in the United States.